Choice can be defined as the mental process of judging the merits of multiple options and selecting one or more of them. Too much choice may not be a good thing. The critical, and often obscure aspect of choice is in the number of "options" perceptible to the chooser. As long as we perceive that we have a choice, we feel satisfied. Most of us do not like "too many options"; They cause a paradox of choice. More often than not, we are satisfied by, and even prefer a binary choice, reducing multiple options down to two to choose from. Both corporate and government propagandists take advantage of this fact and offer us a "binary illusion of choice". In issues that matter, often, the only choice we are offered is a Hobson's Choice: To "take it or leave it"; No real alternative is presented. Of course, when it comes to trivialities, we are offered hundreds if not thousands of choices. What color do you want your car to be? Accepting the world as it is, is a false dilemma, while in fact, another world is possible. The status quo only offers us "dilemmas"; We are deceived into considering only the lesser evil of two or more unattractive options. A better world is possible! Historically, institutionalized religions challenged heterodoxy ("other teachings"), and promoted teachings that conformed to what was believed to be the consistent with the creeds of a particular religion. Orthodoxy restricted choice, all while claiming to prescribe "right choices". Secularism was a reaction to the contradictions and corruption of religious orthodoxy, especially as it related to human choice. Today, we increasingly see secular institutions doing the same thing; restricting choice by concealing heterodox options which challenge the existing hierarchies. Obscurantism is an eternal problem that needs to be solved-over by every new generation. 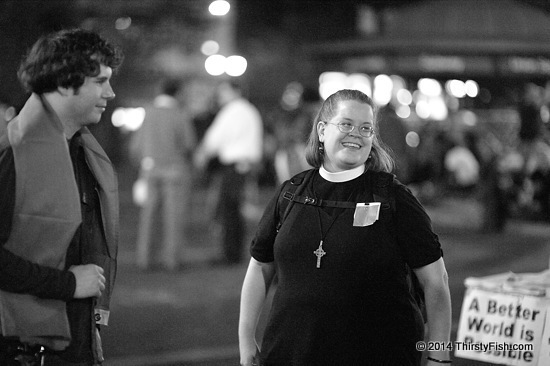 Photographed at an Occupy Wall Street event.